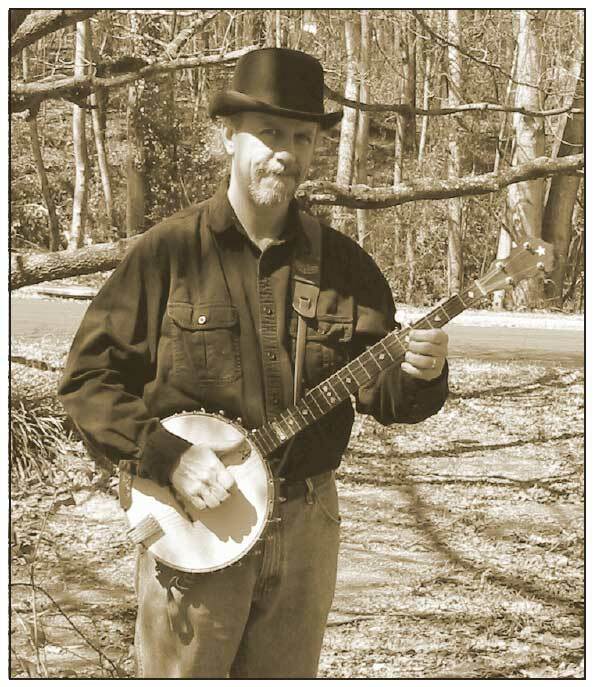 FREE BLUEGRASS STYLE BANJO LESSONS Bradley Laird's Free Banjo Lesson site is here! FREE MANDOLIN LESSONS Brad's Free Mandolin lessons are here. BRAD'S BLUEGRASS BASS INSTRUCTION COURSE Downloadable Bluegrass Bass Course PDF. A picture is worth a thousand words so here is a picture of me standing in the yard on a clear autumn day holding, of course, my banjo. In case you are curious that is a Stewart MacDonald Style 3 which I built from a kit around 1978. You can see that I am using a strap to support the banjo. The strap is connected to the brackets so that it hangs naturally at the angle shown. If you are playing seated everything looks about the same except that your rump is on a chair, a log or a donkey's back. Notice the position of my right hand and thumb! The thumb is extended and resting on or slightly above the 5th string, my fingers are curled into a "c" shape. That is the basic hand position for playing clawhammer style. It is important to know that, in clawhammer style, you will use the BACK of your index (or middle) finger to strike the strings as your hand moves downward towards the ground. It is the back of the fingernail which contacts the string and, as it moves downward, causes the string to vibrate and make that glorious banjo sound. The thumb generally only plays the 5th string and it too plucks in a downward motion. We will discuss the details of all of this soon. I just want to mention it now since the photograph above shows it so clearly. Before you move along to Lesson 3 I'd like you to download and read a little 2-page PDF file which explains how to read tablature. For your information, tablature is just a simple way to write down music for the banjo and, especially with clawhammer style, it is pretty easy! If you already play Scruggs style AND know how to read banjo tablature you can skip the short reading assignment. When you have a basic understanding of tab move on to Lesson 3 and we'll start making some racket! It might be wise to follow this link and get these for your family and friends.